When the name Mexican style eggs is heard, it can be intuited that many colors are going to be in the dish – and you will be totally right. 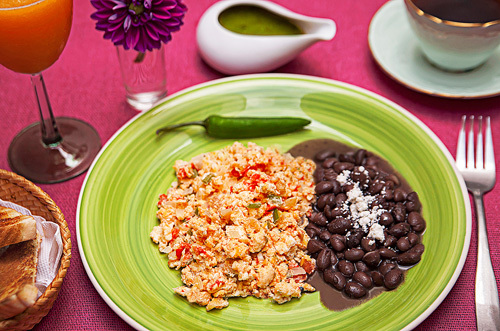 But besides the color there’s also an interesting fusion of flavors, characteristic of the Mexican gastronomy. This recipe consists of scrambled eggs that are prepared with chili, onion and tomato . That’s why the name “Mexican style" is given because it has the Mexican flag green (serrano pepper), white (onion) and red (tomato). With these eggs a very abundant breakfast can be prepared accompanied with refried beans or pot beans or if you want to venture into more flavors with charro beans – and as extra red rice can also be put on the plate. Anyone can prepare the Mexican style eggs as only ingredients have to be chopped and fried. A perfect recipe for beginners. We give the recipe with 1 serrano pepper however more chilies can be used, if you want some spicier Mexican style eggs. We recommend using olive oil in this recipe so the dish has a better flavor. The Mexican style eggs will be ready in maximum 10 minutes . If you want more hotness in your dish leave the serrano pepper veins. Finely chop the serrano pepper with the one you worked, then reserve. Dice 1/4 of an onion and 1 tomato; then set aside. Put in the frying pan the onion dices that were chopped and fry them for approximately 1 minute, until they look a bit transparent; stir regularly. Mix the frying pan ingredients and fry them for approximately 1 minute, until the chili and the tomato are lightly fried; stir regularly. Reduce to low heat and pour in the frying pan the eggs that were beaten in the bowl. Also add in the frying pan 1/4 tablespoon of salt. Mix all the frying pan ingredients and fry the Mexican style eggs for about 2 minutes, until the eggs are well cooked; stir regularly. Suggestion: Accompany the Mexican style eggs with tortillas or bread. Variation: You also have to try the ranch style eggs. Did you like the Mexican Style Eggs? The “Serrano Peppers La Costena" are spicy and they have a very good consistency – ideal for this recipe. Save oil and don’t eat as much fat with the “Misto Oil Sprayer". A very innovative way of using and managing the oil in the kitchen, you will love it. Give more color and life to your Mexican food by using Mexican plates.